The NikeLab Air Humara '17 x Supreme Men's Trail Running Shoe brings you a classic '90s look with updated visuals thanks to New York street label, Supreme. Reflective overlays, fabric mesh and synthetic leather panels take this retro trail runner to a new level. The NikeLab Air Humara &apos;17 x Supreme Men&apos;s Trail Running Shoe brings you a classic &apos;90s look with updated visuals thanks to New York street label, Supreme. Reflective overlays, fabric mesh and synthetic leather panels take this retro trail runner to a new level. Supreme branding reflects off the toe panel, heel panel and heel webbing. The lace tips and heel panel feature the Supreme mantra, &apos;WORLD FAMOUS&apos;. Made for the trail, this shoe features reflective graphics and a reflective, lightweight and breathable mesh upper. 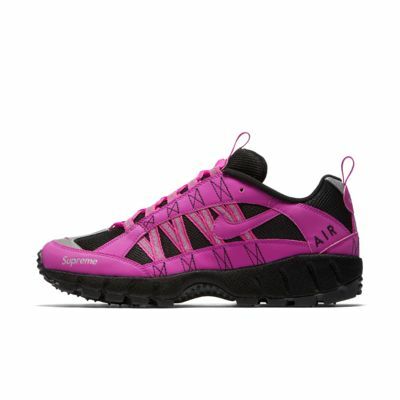 Retaining the Nike Air Humara&apos;s most innovative feature, this version also features a woven midsole fabric wrap for abrasion resistance and sidewall stability. NikeLab teams up with Supreme to inject street culture and energy into a Nike trail-running classic. Accompanying the NikeLab Air Humara x Supreme Trail Running Shoe is a full tracksuit and running cap designed with reflectivity and breathable mesh overlays for a full, head-to-toe look. Four classic colourways deliver an assured statement for wherever the trail may take you.